Coca planters will be giving Pope Francis a pie and other goods made out of coca leaves, when he arrives next July for an official visit to Bolivia. The gifts will be delivered during the scheduled meeting of Francis wish social movements’ organization in Santa Cruz, according to the organizers. 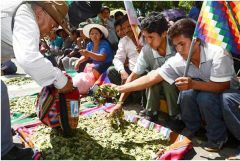 Leonardo Loza, vice-president of the Cochabamba Tropic Federations, an organization of coca planters, said that a group of them will be handing the Pope a pie, mate (infusion coca tea), and other ‘products’ which are made out of the coca plant which is so closely ingrained in the country’s culture and natural medicine. “The initiative is to show the Pope how much has been advanced in the industrialization of the coca plant, which will obviously have a great national and international repercussion” indicated Loza. The gifts presentation will take place in the framework of the meeting with social movements in the city of Santa Cruz in parallel to the Pope’s visit who will be staying in Bolivia from 8 to 10 July, as part of a tour of Ecuador, Bolivia and Paraguay. Bolivia together with Colombia and Peru are three of the main world suppliers and producers of coca leaves, which is the main ingredient for elaborating its illegal derivate, cocaine, amply consumed in the Western world. However coca leaves in Bolivia are closely linked to the country’s indigenous culture and organic medicines, and as such are recognized in Bolivia’s constitution, but a significant part of the leaves production ends up with the drugs industry and cartels. The Bolivian government has insisted in advancing with the industrialization of the plant with the purpose of exporting derivates, although coca leaves remain in the narcotics list of the UN convention against drugs, which thus bans any kind of exports from coca. A year ago the coca planters gave UN Secretary General Ban Ki Moon a coca leaves pie during his visit to Bolivia when the G77 plus China summit in Santa Cruz. The top diplomat accepted the pie but was never seen eating it. Pope Francis is expected in Bolivia on 8 July where he arrives from Ecuador. He will spend a few hours in the capital, La Paz and the neighboring city of El Alto (3.500 meters above sea level) before travelling to Santa Cruz, on the plans, where most of his activities will take place.